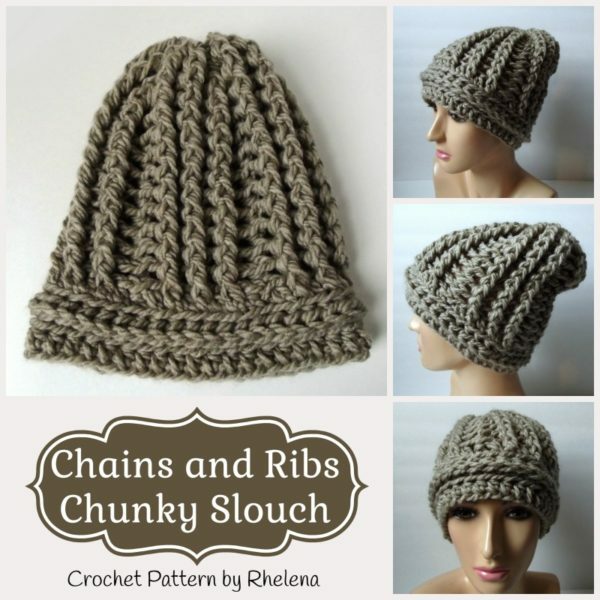 Here is a slouch pattern to go with my Chains and Ribs Chunky Cowl pattern. The set goes well together and is perfect for the winter weather. The hat is crocheted in a chunky yarn and available in one size only, which is an adult small. The hat is big on my small head, and so it might stretch to fit a small to medium in a woman size. Please take measurements, check your gauge and decide from there as to what you need to do in regards to size. So it’s a bit more tricky, but not impossible because you can always experiment with different yarns and hook sizes. Hopefully next week I’ll have one in a worsted yarn to give you more flexibility. Yarn: Loops and Threads Charisma (1 3.5oz ball) Or, use any chunky (5) yarn. Gauge: 3″ over 6 hdc sts. Finished Size: Measures 10″ across the brim when laying flat. Increase or decrease the size in multiples of 8, or use a thinner/thicker yarn and smaller/larger crochet hooks. With 9mm hook, Ch 40, or any multiple of 8. Join with sl st in first ch being careful not to twist chs. Rnd 2: Working in bl only, ch 1, hdc in same st as join and into each st around; join with sl st in first hdc. Rnd 4: Same as rnd 2. Rnd 6: Ch 1, (fphdc, ch 1) in same st as join making sure to catch ch 1 along with the post. (fphdc, ch 1) in next 2 sts, (bphdc, ch 1) in next st, *(fphdc, ch 1) in next 3 sts, (bphdc, ch 1) in next st; rep from * around; join with sl st in first fphdc. Rnds 7-17: Rep rnd 6. FO leaving a 10″ tail for weaving in through the last rnd to pull the hat tight. You may have your own way of doing it, but I skipped all chains and went into the back loops of all stitches. You can also find this pattern on Ravelry and Craftsy.